Have you ever tried chickpea crêpes, also called Farinata which is a typical Italian flatbread? Always on the search for new healthy food inspiration I’ve read about it several times and already got the chickpea flour (also called gram flour or besan flour) home to be prepared when the next opportunity would come. Today was the day! Having a public holiday here in Malta and running out of eggs is not a good combo in our house. The solution?! Remembering about this easy and tasty sounding recipe we gave it a go and ended up in pure bliss. To make it a proper brunch P and I decided to make savory and sweet versions which was really fun. You can truly experiment with whatever you feel like and have in the fridge. And the best thing about the whole thing? This dish is not only easy, healthy and super yummy, but the chickpea flour also contains lots of folate which supports reproducing and maintaining new cells and is therefor great for for future mums and mummies to be. It delivers a boost of iron, magnesium and phosphor (more info here). Also, this dish is gluten free and stands on his own with only a few ingredients! Optional: add some crumbled feta cheese in the end. Mix the batter when the time is over, and prepare a pan on medium heat. Use a tiny bit of coconut oil if it isn’t a nonstick pan. Use a ladle to spread the batter in the pan and fry it about a minute on each side until they are nice and golden. Don’t let the Crêpes in there for too long otherwise they get hard to fold. Hold them warm in the oven or fill them immediately with one of the fillings below or any other filling of your choice. Put your oven on 200°C, chop up the veg, drizzle with olive oil and herbs de provence. Roast it for about 25/30min. Use as a filling. Slice the banana. 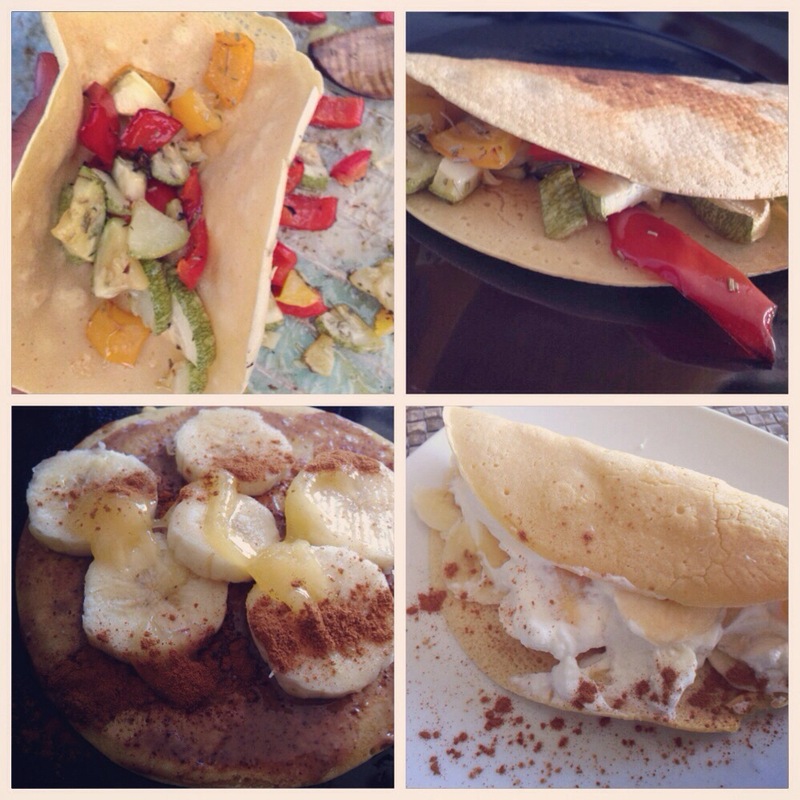 Put some almond butter or greek yoghurt in the Crêpe, add the banana and drizzle with honey and cinnamon.